Stunning and sleek Borgata model in desirable Sun Lakes Oakwood Community! This beautiful 2 bedroom/2.5 bathroom home features a formal living and dining room with gas fireplace, spacious office/den with built in bookcases, a large updated eat-in kitchen with black granite countertops, breakfast bar and desk area. Your open concept kitchen and family room areas are complimented by a wall of windows and a large sliding glass door that leads to an extended covered paver patio with built-in barbecue. Enjoy the luxury of retreating to the updated master suite with sitting area, separate shower/tub, dual sinks and large walk-in closet. This home features only fine finishes and exquisite upgrades like custom wood shutters throughout. Please read supplemental comments for additional description. Park your cars and golf cart in this high-end epoxy floor finished 2.5 car garage with lots of built in cabinets. This garage is so clean you could eat off the floor! Also don't forget to make yourself available for community dining, tennis, live music, racquetball, pickleball, walking trails, a 25 meter lap pool, spa and sauna. Shopping and other dining options are available just a short distance in the Ocotillo area. 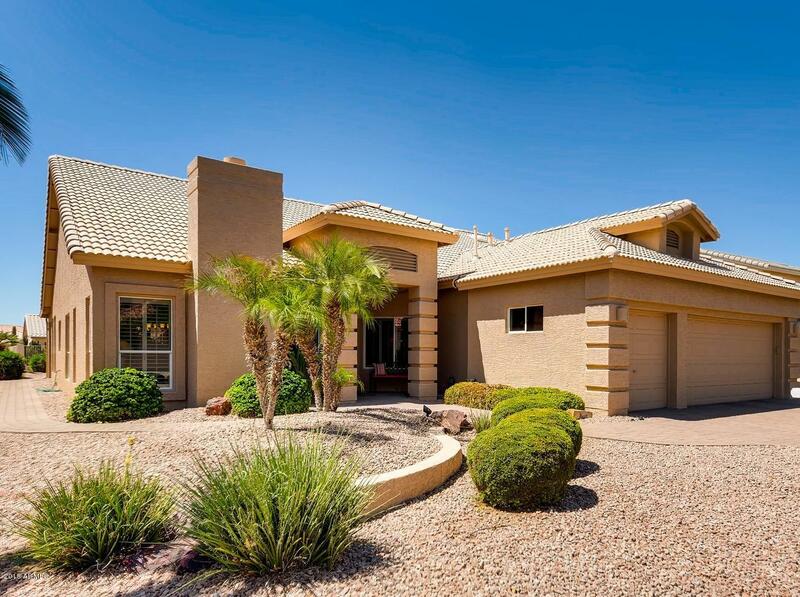 This is resort style living at its best and this home is your ideal Sun Lakes Oasis!